The mission of the UMA Campus Assessment Response Evaluation Team (CARE) is to coordinate and implement policy development, education, and timely intervention in regard to students exhibiting signs of serious distress, or engaging in harmful or disruptive behavior. 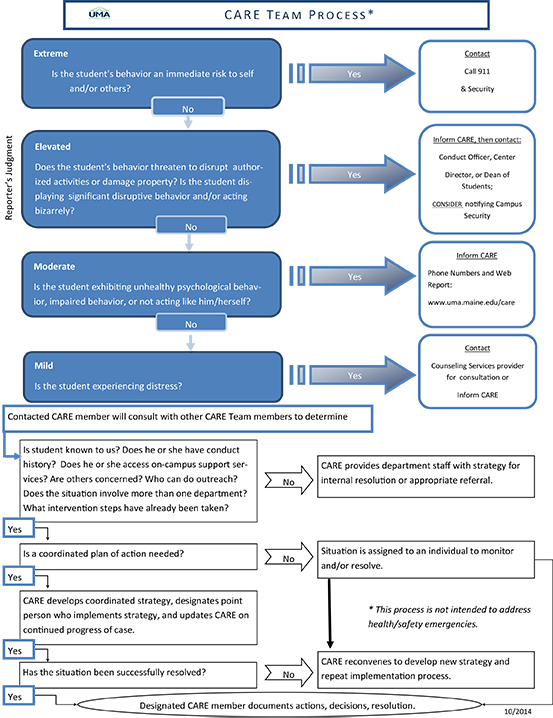 The CARE Team is not a crisis or emergency response team, but provides a system for proactive intervention to student behaviors of concern in order to reduce disruption and facilitate a safe, respectful and productive learning and working environment. The CARE Team has provided a webform here for submitting concerns. Go to and complete the CARE Referral Form. You will be asked for basic information about the student, a brief description of the incident or behaviors that prompted the referral, and contact information for you (in case the Team has follow-up questions). How do I know if my concern is a CARE Team issue or if my concern would more appropriately be handled by other campus resources? You do not have to make this determination; the CARE Team will do it for you. The most critical step is that you report your concern. If another campus resource is more appropriate, the CARE Team will refer the student and handle the transfer of information. Typically, behaviors that pose a threat to safety or that cause a significant community disruption qualify for the CARE Team, while students who experience problems coping with life challenges or have mental health issues are appropriate referrals to campus Counseling Staff. Anyone who feels that a student is in significant distress or might be a threat to themselves and/or the community can make a Care Team referral. This includes students, faculty, staff, and other community members. Do I have to tell the student that I've made a referral? Is the referral confidential? You are not required to tell the student, although that may be helpful. If you do tell him or her, don’t promise confidentiality, although the information will be handled with discretion. The CARE Team process involves gathering information from all relevant sources on a need-to-know basis. The primary goal is to act in the best interest of the student and the University community. When your referral is received by members of the CARE Team they will use the information to determine the nature of the concern, and the most appropriate referral or intervention. What happens to the student in the CARE Team process? The type of intervention depends upon the student’s behavior. Options are wide ranging. Some examples include: arranging a conversation with the student, having a counselor contact him/her, referral to the student conduct process, or involuntary withdrawal from the University. What is my role in the CARE Team process? Your essential role is to share your concern, either directly with the student or with the CARE via the referral form. Can you tell me more about the CARE Team process? To promote a safe, respectful working and learning environment by fostering a university wide culture of communication, collaboration and proactive intervention. To support student academic progress and personal well-being via primarily educational, rather than punitive means, consistent with established protocol and transparent procedures. To provide education and professional development opportunities for the University Community in identifying and managing disruptive or harmful student behavior. To assess, evaluate and evolve team function and protocols over time as best practices are identified and refined. Identify resources and develop specific strategies to respond to potentially harmful or disruptive student behavior. Receive referrals and gather information about student behaviors of concern as a basis to plan and facilitate proactive intervention. Make recommendations to college officials regarding issues and policies in need of attention. Develop and disseminate informational materials focused on identification, management and prevention of harmful or disruptive behavior. In everyone’s life there may be times when he or she feels depressed or upset. The following list identifies symptoms that, if consistent or severe, may suggest that he or she could benefit from assistance. Any of these symptoms may be expressed in the student’s behavior, speaking, and/or writing, including in the online environment. The following videos, created by members of the CARE Team, provide interested individuals with an overview of several topical areas. Coordinator of Community Standards and Mediation, Laura Rodas, talks about the University of Maine System Conduct Code and how, when and to whom it can be applied. Robert Marden, Assistant Director of Administrative Services, speaks to what students, faculty, and staff can do to keep safe on campus, prevent property loss, and respond to urgent campus safety matters. This video, featuring Don Osier, Director of Learning Success, is about the intersection of disability rights, ADA laws, and student behavior on campus, online, and in the classroom.